U.S. and coalition military forces have continued to attack Islamic terrorists in Syria and Iraq, with 27 airstrikes reported on Thanksgiving Day. 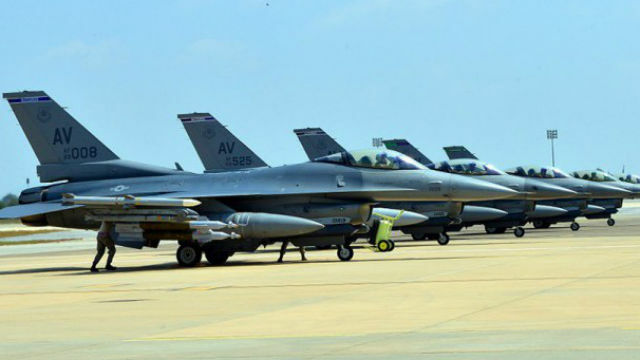 The strikes under Operation Inherent Resolve against the Islamic State of Iraq and the Levant, or ISIl, the official name of the terrorist group ISIS, were reported by the Department of Defense. Near Hawl, two strikes struck two separate ISIL tactical units and destroyed two ISIL fighting positions and wounded two ISIL fighters. Near Raqqah, two strikes struck an ISIL tactical unit and an ISIL vehicle staging area and destroyed an ISIL vehicle. Near Baghdadi, one strike destroyed two ISIL rocket positions. Near Albu Hayat, one strike struck an ISIL tactical unit and destroyed an ISIL vehicle. Near Kisik, two strikes struck an ISIL tactical unit and destroyed two ISIL vehicles and five ISIL bunkers. Near Mosul, five strikes struck three separate ISIL tactical units and an ISIL checkpoint and destroyed five ISIL fighting positions, an ISIL vehicle, and an ISIL building. Near Ramadi, seven strikes struck five separate ISIL tactical units and destroyed two ISIL fighting positions, two ISIL vehicles, an ISIL mortar, two ISIL structures, an ISIL boat, an ISIL front-end loader, cratered an ISIL road, suppressed an ISIL vehicle’s movement, and denied ISIL access to terrain. Near Sinjar, five strikes struck three separate ISIL tactical units and destroyed an ISIL vehicle, an ISIL heavy machine gun, two ISIL fighting positions, damaged an ISIL vehicle, suppressed an ISIL heavy machine gun, and wounded an ISIL fighter. Near Sultan Abdallah, two strikes struck two ISIL tactical units and destroyed three ISIL fighting positions and an ISIL vehicle. The Pentagon describes a strike as one or more kinetic events that occur in roughly the same geographic location to produce a single, sometimes cumulative effect. So multiple aircraft delivering dozens of weapons against a single target area are considered a single strike. Coalition nations conducting strikes include the United States, Australia, Belgium, Canada, Denmark, France, Jordan, the Netherlands, the United Kingdom, Bahrain, Jordan, Saudi Arabia, Turkey and the United Arab Emirates.